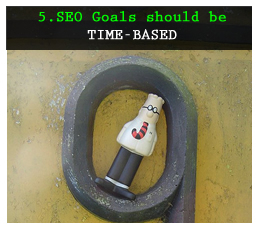 In order to develop a cost-effective SEO Process with a high return on investment is fundamental to set goals that target the site’s business needs and take into consideration the market and site behavior, characteristics, restrictions, available resources and time, otherwise is easy to end-up with unrealistic goals that will lead to a non-effective SEO process. 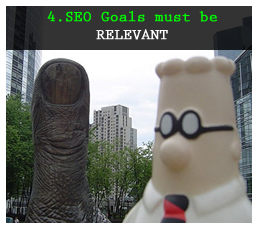 Do you want to achieve with the SEO process in order to help your site to accomplish its objectives? Is the SEO situation of the site? Present rankings and optimization? Is your target market and how does it behave? Will be involved and you can count to support you in the SEO Process -developers, writers, link builders, community managers, etc.-? 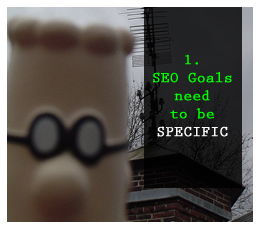 Will be the SEO process activities implemented: In-house, an external agency or freelancers? Does your business have online presence besides the site -social networks, communities, affiliates, etc.-? Are the site technical, content or promotion constraints and requirements? Do you want to start a SEO process? -identify expectations in order to manage them-. When you have the answers to these questions you can do a prioritized list of the site requirements, restrictions and an overview of its online business, resources and organization. 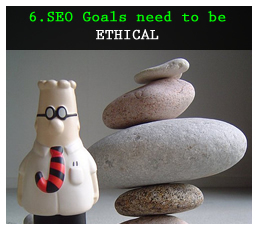 With this information you can do an audit to verify the answers and develop the first draft of the SEO goals. 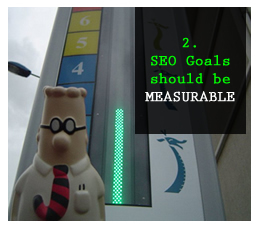 How will you measure the achievement of each of the SEO process goals? How often and for how long? How can you organize and automate data gathering and reporting? -This can represent a huge difference if it’s a big process or you are managing many SEO processes at the same time-. 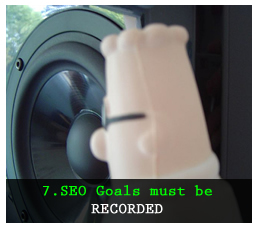 Review the first draft of SEO goals and answer these questions for each one of them. Make sure you will have access to the data and that you can gather all the necessary information from the start of the process. If you see this is not the case then you will need to rethink that goal and how to approach that need in a way that is measurable. Now that you have a complete overview with a list of the desired goals that are measurable and a list of the site requirements, restrictions, present status and resources you can verify how reasonable are these goals according to the site characteristics and their importance towards the site business. 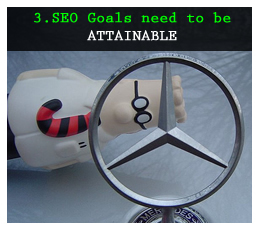 With this information identify which are the feasible SEO strategies to implement to achieve these goals. Additionally, you will be able to prioritize them for the present SEO Process -or even leave them for the following ones if they are too ambitious and not realistic to achieve at the moment-. With a list of specific, measurable and attainable goals is important to verify their relevancy to the site business and the type of conversions you’re looking to achieve with each one of them. Asses the importance of each of the specified goals towards the site benefits, make sure that the expected benefits are reasonably higher than the related costs of implementing the strategies to achieve them -for a high ROI- and prioritize (or leave for following SEO Processes) again your SEO goals according to this. When do you plan to achieve each of your goals? Take into consideration the required time to implement the strategies and related activities. Are these times under the expected timeframe? How long it will take to start getting results for each stage of the SEO Process? Take into account the business seasonality and develop a schedule that you can use to follow-up the SEO activities implementation and goals achievement through their key performance indicators. Verify that the goals you look to achieve and the strategies you have planned to implement follow the search engines guidelines and your own business -and the client’s business- ethical principles. Remember that it’s not only important to achieve a result that will benefit you from a business perspective but that you can also be proud of what you do. Additionally, if you rely your strategy on taking advantage of some search engines vulnerabilities you will end up losing what you have achieved sooner than later. To effectively measure the success is fundamental to document your goals, the related strategies and planned activities, along with the site characteristics, requirements and initial status. It’s also important that you don’t only track but also keep a record of the activities you implement during the SEO process and verify that these follow the schedule you have set for them. 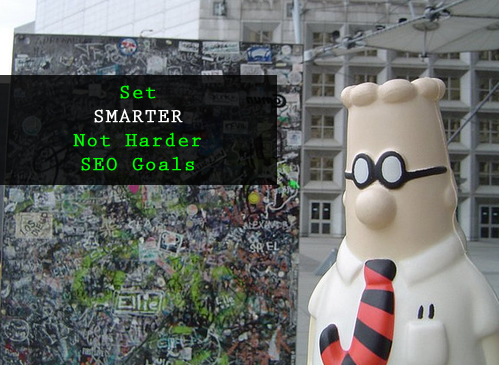 Although you may have already begun your SEO process it’s never late to focus it with with smarter -not harder- goals that will help you to achieve the results you really need. You can also take a look at this larger list of questions you can ask to identify the best SEO strategy and the different types of SEO goals you can have depending on the results you are looking to achieve.